A primatologist I met wondered how to present the soap opera of baboon life, so that their personalities and stories would be as easy to follow as an episode of the sit-com, Friends. This idea got me started on a series of experiments I call Primate Cinema, videos that translate or somehow expose the alternate universe of nonhuman primates for human audiences. Through the lenses of primatology and media studies, stories about what it means to be human—or animal—unfold. 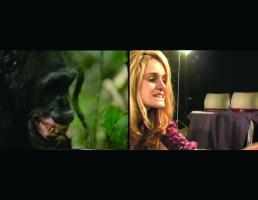 Primate Cinema explores what we share with animals, how we differ, and how cinema works to instill myths about nature.